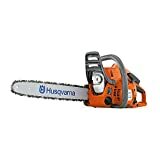 At the lower end of Husqvarna’s chainsaw line is the 240. It’s designed to do light work around the yard, such as felling small trees or pruning bigger ones. It’s not as packed with features as its bigger cousins, but it’s still got some serious power. The question, based on the totality of customer experiences, is whether you can get it started. That’s where you’ll have to choose whether to get the 240 or a different model. The 240 weighs just 10.3 pounds but delivers 38.2 cc of power. That’s quite a lot of bang for your buck, considering that it’s already on the low end of the price spectrum. It’s powerful enough that while it’s rated to a 16-inch max. bar, you can probably use it to cut through 20-inch pieces of wood with little trouble. However, while it’s got enough muscle to power through small jobs and some medium ones, it’s not going to be the only saw you need unless all you have is pruning work. This saw may have to be one of several in your inventory. The fastest way to get fatigued using a chainsaw is to use one that is heavy in weight and heavy in vibrations. A big, heavy saw that shakes around a lot will wear you out, and because fatigue is a leading cause of accidents, these types of saws are more dangerous to use. The Husqvarna 240 combines light weight and vibration dampening technology to cut down on user fatigue. You might have to stop occasionally to refuel the chainsaw, but you will have to stop to “refuel” yourself less often. The very nature of using a chainsaw means operating it in an atmosphere full of flying debris. Often, that debris gets caught in your tool’s air intake, and you must spend time breaking it down to clean it out. Husqvarna’s centrifugal air system means that large pieces of debris get caught before they hit the filter. It’s a snap to remove them, and this makes keeping your chainsaw in operational order much easier. Husqvarna has a standard two-year warranty, with the option to extend it to three or four years at time of purchase. What gas-to-oil ratio is recommended? Is this saw powerful enough for big jobs? No. The 38.2 cc engine is underpowered for a top home-use chainsaw, and very much underpowered for a professional-grade chainsaw. The 240 is designed for light and maybe medium work. What’s the maximum size piece of wood you can cut with this saw? It comes with a 16-inch guide, but it’s got enough power to possibly get through a 20-inch piece of wood. Just make sure you exercise care in doing so. We decided to sift through online reviews to see what experiences other people have had with the 240. If you’re going to take reviews seriously, you should probably take them all seriously, right? There are two kinds of people who have purchased the 240: those who really like it, and those who really hate it. The Husqvarna brings out strong emotions across the board. We’ll start with the people who hated it, mostly because they appear to share a pretty common complaint. The 240 is hard to start, and when it starts there’s some difficulty in keeping it going. To these folks, the 240 is a saw that just doesn’t want to do the work it was purchased to do. We have another name for that kind of tool: a paperweight. It’s true that the 240 doesn’t come with the Smart Start system, like a lot of Husqvarna’s other modern chainsaws. This will make operating it a little more complicated if you’re used to other Husqvarna models. It’s also a little harder to start than models built by competitors. People who find themselves confounded by two-cycle engines should keep this in mind when looking at this chainsaw, and consider looking for one that starts more easily. However, the people who like this saw really like it. It’s lightweight, and it can handle larger pieces of wood than you’d expect and keep going. It’s powerful, yet comfortable, and performing basic maintenance on it is pretty straightforward. For the folks who say they can’t get the 240 started, they have this piece of advice: read the owner’s manual. Usually in these matters, we find that opinions lean strongly in one direction. In this case, it’s more of a split decision. Buy the Husqvarna 240, and you will either really like it or really hate it. We’d advise you to read the owner’s manual before coming to a conclusion, though. Whether to buy the Husqvarna 240 comes down to one question: do you think you can get it started? Normally, a large number of people who say they can’t get a tool going suffer from operator error. In this case, enough reviews mention issues that this seems like more than a problem with inexperienced operators, or occasional lemons getting sent out from the factory. If this saw does start right up, the odds are good that you’re in for a great chainsaw experience.